Jimmy Carbone is collaborating with Graham Winton of Paloma Rocket for a new venture in the currently-closed Jimmy's No. 43 on Seventh Street. If the two get the OK from CB3 for a new liquor license, then they plan to open Paloma Rocket-Carbone Pizza in the basement space here between Second Avenue and Cooper Square. Financial difficulties forced Carbone to close Jimmy’s No. 43, the restaurant he owned and operated for 12 years this past August. The lease has been up for two years — Carbone has been operating on a month-to-month lease since then — and in February the landlord "dialed it up" and told him that Jimmy's could stay but he would have to start looking for a partner to help with back rent and, in the meantime, he'd have to pay more to remain, according to Carbone. He says it's been a long road getting to this point. Carbone says the financial difficulties started in 2010 when the city began issuing letter grades for bars and restaurants. Jimmy's was inspected five times in six months and Carbone says it took him three years to pay off the $15,000 in fines as a result of those inspections. 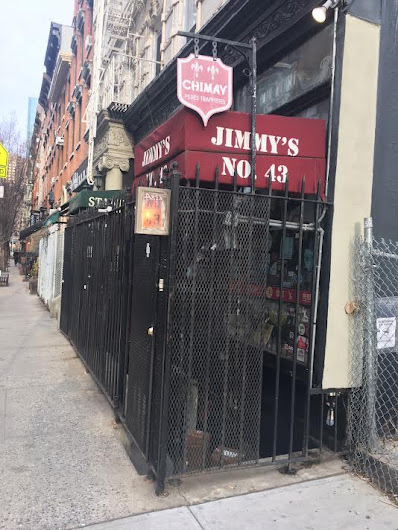 In 2013, Jimmy's was shuttered twice by the Health Department, first because of rodent issues that stemmed from Hurricane Sandy; another time because Carbone couldn't afford to pay the fines. There was also lost business in the aftermath of the deadly gas explosion in March 2015. In addition, Carbone fell sick last fall and wound up in a hospital. "That was from my 20 years of running a restaurant," Carbone told me on the phone the other day. "I let my health go. I had diabetes." And now? "I'm getting better. Having a break was good for me. I lost some weight." While Carbone worked on getting healthy, he also continued to look for a collaborator. Enter Winton, an East Village resident who had been running Paloma Rocket, a specialty beer bar with a self-service feature on Clinton Street. "I saw what they were doing at Paloma Rocket and I liked it," Carbone said. "I liked the self-guided beer tour aspect of it." "I'm hoping to get approved as a new entity with Paloma Rocket as my partners," he said. "Operation-wise, it will pretty much be the same — the same Jimmy's vibe." Carbone has been honing his pizza-making skills of late. A new baking oven in the space will serve as the centerpiece for the menu, which, aside from pizza, will include a variety of roasted meats and vegetables. During the day, Carbone wants to start a kind of "bread CSA," and provide new bakers starting out with a place to work on their products and a venue to sell them in. In an email, Winton shared some thoughts on the space. "We hope to make it a fun, value-driven hangout with a neighborhood vibe," said Winton, who mentioned a family-friendly attraction. "Kids with books eat for free." Meanwhile, they are in the process of getting a lease. "The landlord has been really decent. He gave us a chance. He carried me," Carbone said. "We had some issues. He gave me time to pay the rent." If all goes well, then he hopes to have the new space open in three months — enough time for minor renovations, such as cleaning and painting, and allowing for the SLA paperwork to arrive. "My wish is that England winning the World Cup this year will be celebrated there," Winton said. After a seven-month hiatus, Carbone is hopeful for a return engagement at Jimmy's. "I miss the gatherings — the get-togethers, the going-away and birthday parties. I love hosting people. That's what my whole career has been... and that space lends itself to it," said Carbone, who previously owned Mugsy's Chow Chow on Second Avenue. "You hear so many bad stories about places closing. For me to reopen, with a whole new lease along with the changes — that would be a huge victory for small businesses, the community. I think everybody wants places like mine to do well." I wish all the best to Jimmy. He is just the greatest and most generous guy, a real advocate for the neighborhood and local businesses. This sounds wonderful! Your Iowa friends would love to come for that opening! I'm glad to hear that things might be looking up for Jimmy. I went there years ago on the recommendation of one of the bartenders at Standings when we had stopped in for a beer or two were looking for something to eat. For a [lace that cooked everything on hot plates (at least at that time) it was terrific. Never had a chance to go back and was sad to hear that Jimmy had been forced to close. Literally a new lease on life. Jimmy has been a champion of the Craft beer movement, and a huge supporter of local brewers and beer bars, including mine. All of us in the industry owe him a debt of gratitude. Wishing nothing but the best for Jimmy Pots and Pans.